Hyderabad to Manali can be reached via flight as well as train. You need to decide according to your accessibility. Flight will take around 2-5 hours to reach Manali. The cost would be somewhere between Rs.2500-19000. Once you land in Delhi you can catch a bus to Manali which will take around 15 hours to reach Manali. The ticket is not that expensive according to the comfort bus gives you. Bus tickets would cost you between Rs.750-1800. You can opt for a train if you wish to. Train would take around 21 hours to reach Delhi. Cost would range from Rs.200-2300. Once you reach Delhi you can take a bus. 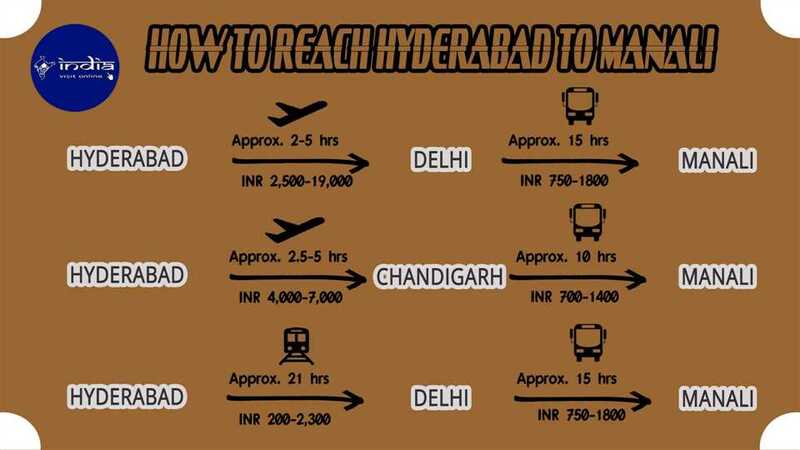 You have another option as well you can catch a flight from Hyderabad to Chandigarh which will take around 2.5-5 hours. The flight will cost you Rs.4000-7000. You can have a road trip via bus to Manali which will take around 10 hours. The bus tickets will be between Rs.700-1400.